ColorBuster is a fairly simple strategy puzzle game that will easily keep you occupied as you guide Hect0r, your robot, through 50 levels of box-pushing. Don’t let the “simple” tag fool you, though. Remember, games like Tetris and Bejeweled are simple. The game takes place on a variety of grids in deep space. Your task is to pack all the crates of the same color into one crate, and then move them to a teleport. At the same time, you push radioactive boxes off the edge of the grid. Sounds simple, but as with all good puzzle games, the levels get harder to solve. There’s often only one way to complete a level and one wrong move could leave a block stuck. 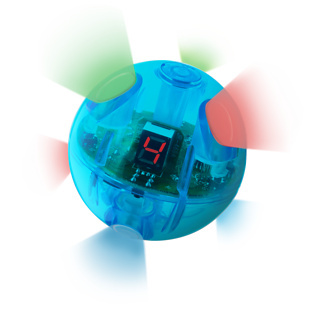 There are two gameplay modes and two ways of controlling Hect0r. 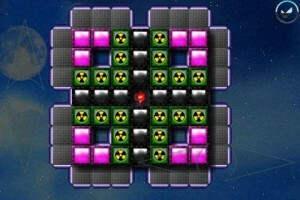 In “Classic” mode your robot and colored blocks are “safe” — in other words, they can’t fall off the edge of the grid. In “Arcade” mode it’s possible for objects to fall off the grid. Hect0r can be controlled via four on-screen arrows (up and down on the left-hand side of the screen, and left and right in the bottom right-hand corner) or by swiping a finger in the direction you wish him to travel. The graphics are pretty good and are perfectly acceptable for the gameplay. Granted, they’re not the most spectacular ever, but they clearly show all the vital components (ro-bot, blocks, hazards, grid, teleport). There’s a definite 8-bit / retro feel to the whole thing. The audio, too, is pretty decent, with some interesting original music to keep you enter-tained through the levels. It took me a little while to get used to the two control methods, but that’s often the case with any new iPhone application given that every developer has to find a new way of im-plementing controls on the touchscreen. I wasn’t madly keen on having the virtual arrow buttons in different places on the screen. Personally I’d have preferred them closer together, perhaps as an inverted T as you’d find on a computer keyboard, in one corner. However, I know it would become second nature soon enough. Similarly, the swiping motions sometimes had me falling off the grid (in arcade mode), but I got better with practice. One thing I really wasn’t keen on was the shading on the text. Perhaps I should’ve had my iPhone’s brightness turned up higher, but I found it a little difficult to read at times. No biggie, though, as there’s not much text except on the options and high score screens. For $1.99 (and currently half price at 99c) it won’t break the bank to purchase ColorBuster, and you’ll certainly get plenty of gameplay from it. Don’t be fooled that the first few levels are quite easy, as the challenge soon ramps up. If you like puzzle games that require you to think strategically and you’re not after some-thing fast and furious, it’s definitely worth a look. It seemed to work for Radiohead last year when they released their In Rainbows album on a “pay what you think it’s worth” model, and now software company Eidos Interactive is looking to do the same with the latest incarnation of its Championship Manager football game. 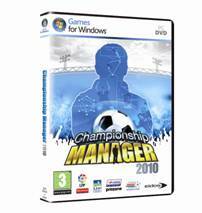 Championship Manager 2010 for PC launches today, and can be purchased online for as little as one British penny (plus a handling fee of £2.50). Sony has announced the latest instalment of its popular SingStar software for PS2 and PS3 consoles, with the addition of SingStar Queen. 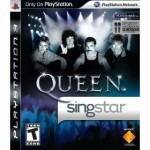 Sony in London collaborated with the band to pack over 20 classic Queen songs into the package, including “We Are The Champions”, “Another One Bites The Dust”, “We Will Rock You”, “Bohemian Rhapsody” and “Under Pressure”.